What It’s About: Movie director and man of action Carl Denham (Robert Armstrong) casts starving, photogenic Ann Darrow (Fay Wray) as the lead in his latest picture. Denham needs an amateur because no agent in the city will sign a client to journey with Denham, a producer of documentaries known for taking any and all chances needed to get the footage he wants. On this voyage Denham won’t even tell his crew where he plans on taking them: uncharted Skull Island. There the islanders sacrifice “brides” to their god, Kong, a fifty foot tall ape who reigns supreme even in a land crawling with prehistoric creatures. Will Wray survive her time on the island, and can Kong survive against the industrial terrors of the Jazz Age? Why Watch it Today? 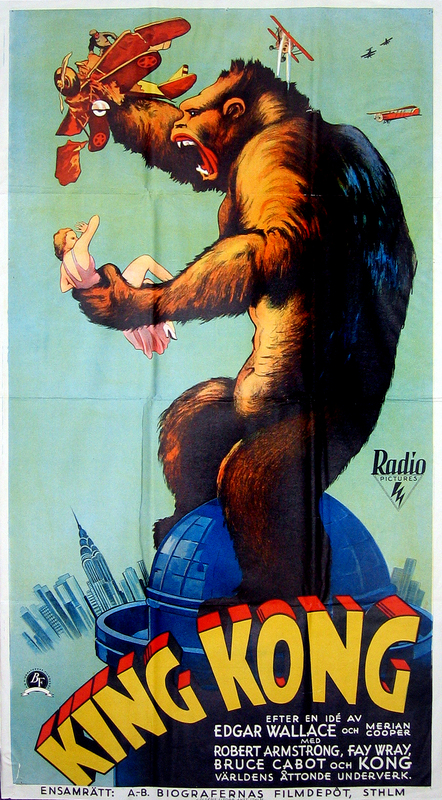 : Although it is only a dim memory to me, my older brother fondly recalls watching the original King Kong (along with its direct sequel Son of Kong and co-writer/director/producer Merian C. Cooper and co-director/producer Ernest B. Schoedsack’s kinder, gentler follow-up Mighty Joe Young) every Thanksgiving. Living in Connecticut, we were able to watch New York City’s WOR, which ran the films beginning in the early 1970s through 1985 in an attempt to compete with football games and parades. Keep the tradition alive by watching the first great Kaiju film sometime between the parades and the pumpkin pie. We wish all of our American readers a Happy Thanksgiving! Englehorn is skeptical of the chances of an expedition so bereft of Mo. This entry was posted in Black and White, Dinosaurs, Event Film, Giant Animals, Giant Apes, Kaiju, Lost World, Monster, Movie of the Day, Stop Motion Animation, The Original and tagged "apes love blondes", apes, biplane, Bruce Cabot, David O. Selznick, Edgar Wallace, Empire State Building, Ernest B. Schoedsack, Fay Wray, King Kong, Max Steiner, Merian C. Cooper, National Film Registry, natives, New York City, Noble Johnson, obligatory love interest, RKO, Robert Armstrong, sacrifice, Skull Island, Willis O'Brien. wor, channel 9, used to be somethin’….eurotrash horror movies on saturday night, 1940s serials during long kiddie programs, dubbed versions of godard’s CONTEMPT and ALPHAVILLE, and joe franklin showing silent movies, and interviewing a nasty william wellman. and they had something, in 1960s (?) called FOR ADULTS ONLY, with maybe a dubbed version of fellini’s LA DOLCHE VITA among the movies shown.